Sunday was National Tequila Day so I decided to celebrate the occasion, as I always do, with food! I took to the internet to draw inspiration from a Guy Fieri recipe for this cook. The recipe is easy to make and impressed my family. The balance of the tequila with the lime juice paired perfectly with the flank steak. In addition, you would be surprised to know there are actually health benefits to eating steak… 31 Science-Backed Health Benefits of Steak to be exact. So, between the tequila in the marinade and the health benefits of the steak you have a perfectly balanced meal! 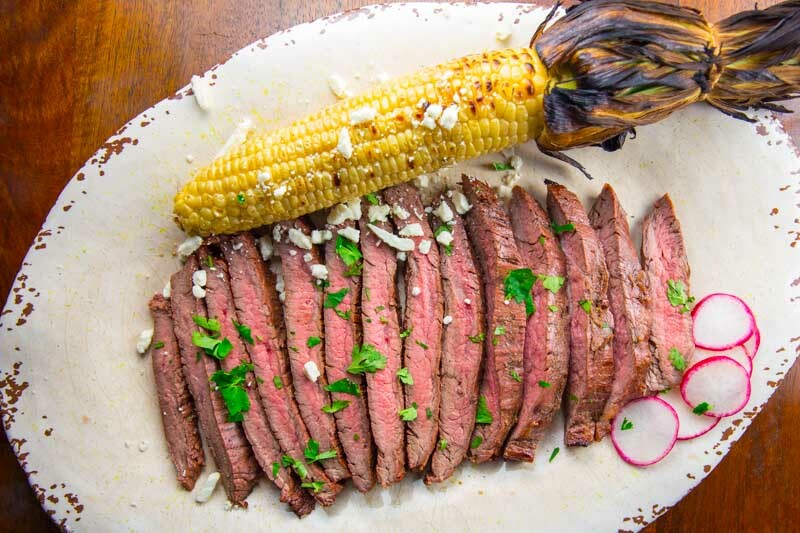 Now sit back, grab an ice cold glass of tequila, and enjoy this post for Grilled Tequila Lime Flank Steak. I had a bottle of Sauza Blue Silver Tequila on hand which worked perfectly with this recipe. Flank steak is a great cut of meat for this recipe. Getting the ingredients ready for the marinade was simple: cumin, tequila, soy sauce, garlic, cilantro, lime juice, jalapeno, Serrano peppers. After the steak sat in the marinade for 3 hours I took it out, preheated the Big Green Egg to 500°, and cooked it direct 4 minutes per side until it measured 130° with a meat thermometer. Served with roasted corn, queso blanco, sliced radish, cilantro, tortilla… this meal was amazing! This recipe for Grilled Tequila Lime Flank Steak is the perfect dish to make when celebrating National Tequila Day! This is a Guy Fieri recipe I modified for the Kamado grill. Prepare the Big Green Egg by preheating to 500° cooking direct. Remove the steak from the marinade, reserving the marinade. Put the marinade in small saucepot and bring to a boil. Then strain and reserve. Place the steak on the BGE (direct). Cook for 4 minutes, turn 180 degrees, and cook for 3 minutes more (to create cross grill marks). Flip over and finish cooking for 3 to 5 minutes, depending on desired doneness. Remove from the grill to a cutting board and let rest, lightly covered, for 5 minutes. This is a unique flavor that only 2 people out of 6 at dinner really liked. The lime and soy sauce combination is a bit unique, so consider doing on a small piece of meat and not a large amount first. I liked it, but it is a unique taste.